GuitarControl.com released a new video guitar lesson from GuitarControl.com instructor and creator Claude Johnson. In this guitar lesson, now available on YouTube.com, Claude Johnson teaches a lesson on playing scales with open strings on guitar. 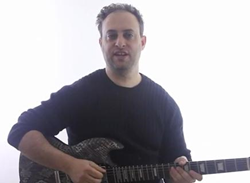 Johnson talks about the advantages to being able to play scales using open strings by demonstrating how you can add melody lines to chord changes easily with open string scales. Claude demonstrates the difference between playing conventional scales and open string scales by performing major scales of both types. Claude plays an example by strumming the chords G and C and adding in melody lines using the major scale with open strings. Johnson demonstrates how to play the open string major scale as follows; 3rd fret of the 6th string with 2nd finger to the open 5th string to the 2nd fret with first finger to the 3rd fret with 2nd finger to the open 4th string to the 2nd fret with first finger to the 4th fret with 3rd finger to the open 3rd string to the 2nd fret with 2nd finger to the open 2nd string to the first fret with first finger to the 3rd fret with 3rd finger to the open first string to the 2nd fret with 2nd finger and finally the 3rd fret with 3rd finger. Guitar TAB’s are available for this easy beginner guitar lesson at GuitarControl.com.